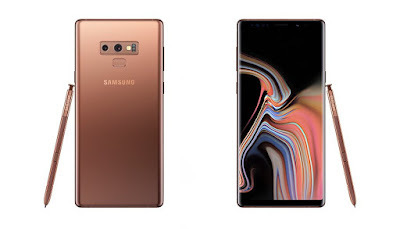 Samsung has launched Samsung Galaxy Note9 smartphone in New York It has a 6.4-inch Quad HD+ Super AMOLED Display with up to 8GB RAM and 512GB Storage. It also has an improved S Pen stylus with Bluetooth support that has a button on its surface along with a clicker on the bottom that lets you take selfies and group pictures, present slides, pause and play video, and more. Samsung also said that it will open it to developers later this year so that they can integrate the S Pen’s Bluetooth functionalities into their apps. It has stereo speakers tuned by AKG and supports Dolby Atmos, similar to the S9 series. It also has AR Emoji that uses machine learning to analyze and map more than 100 facial features to create a 3D model that reflects and imitates expressions. Packed with a 4000mAh battery which supports both wired Adaptive fast charging as well as wireless fast charging. Samsung Galaxy Note9 comes in Midnight Black, Lavender Purple, Metallic Copper with matching S Pen, and Ocean Blue with a Yellow S Pen Priced at $999.99 for the 6GB RAM with 128GB storage version and the 8GB RAM with 512GB version costs $1,249.99 in the U.S. and will be available from August 24, 2018 with pre-orders starting tomorrow, August 10, 2018. Samsung Galaxy Note 9 is priced at Php55,990 (6GB + 128GB) and Php75,990 (8GB + 512GB). Pre-order starts August 11 and ends on the 19th. Those who pre-order the 128GB variant will receive a free Gearfit or Gear Iconx or Galaxy Tab A7, Nanofixit protection, and 1-year insurance. Those who pre-order the 512GB variant, on the other hand, is entitled to a 32-inch HD Smart TV with 2-years of warranty, Nanofixit protection, and 1-year insurance.